The new Service Tray conveniently holds pens, note pads, meds and other small items. A lip that is 1/4″ deep prevents these items from rolling off. The tray has a cleanable surface that can be removed and reapplied. Our tray flips up and stows under the monitor and can be rotated separately from both the monitor and keyboard tray. The Service Tray mounts to any ICW arm that has our new Ultra Flip Up Keyboard Tray. This is a custom design that requires two sub assemblies to create this mount configuration. Please call one of our product specialists at 800-558-4435 or email us at sales@icwusa.com for more information. The Elite 5220 Double Arm Wall Mount provides finger-light movement, optimum viewing angles and unsurpassed reach, making it ideal for healthcare and dental environments. The arm is simple to adjust and effortless to use so caregivers can focus on the patient. The monitor tilts, swivels and rotates–reducing screen glare and easing neck, back and eye strain. The Elite 5220 arm is available as a wall mount, wall track mount, pole mount or desk mount. It can be configured with an LCD only or with an LCD and keyboard tray. The Elite 5220 computer mounting arm stows compactly, yet reaches well into the room. The arm mounts to the wall in a narrow footprint of just 3″, stows 10.5″ (26.7 cm) from the wall, and has a horizontal reach of 60″ (152.4 cm) with LCD only, and 72″ (183 cm) with LCD and keyboard tray. 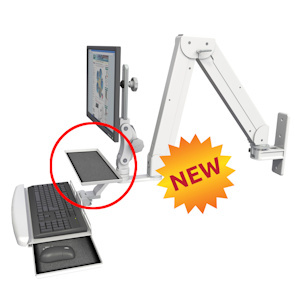 Monitor and keyboard can be positioned exactly where needed for best ergonomics, avoiding eye, neck and back strain. With an LCD only, the arm reaches 60″ (152.4 cm) horizontally. With the flip-up keyboard tray, the arm reaches 72″ (183 cm) horizontally. The arm with LCD and keyboard tray stows compactly 10.5″ (26.7 cm) from the wall.